Facing into an exam is never easy, particularly if your company is paying for it, or if you are doing it with a group of work colleagues; you don’t want to be seen as a failure. At the moment of writing this, there are two well-known certificate centres. The first one is the scrum.org organisation, run by Ken Schwaber, which does a certification titled Professional Scrum Master (PSM). The second is the Scrum Alliance team, which makes you Certified Scum Master (CSM). In this article, I am writing about PSM certification, but those hints are also valid for CSM candidates. To pass the PSM exam at the first level, you need to focus both on preparation for the exam, and on the exam itself. Below you can find seven tips that can definitely help you in reaching your goal. 1. Attend a good Scrum Master training course. It all begins with training. You can study on your own, but it is like learning the rules of physics from a book. It is possible, but without any practice and instant feedback from the trainer, you may understand things the wrong way. There is a lot to be learned from the classroom environment – feedback and questions from other student enhance the learning experience. There is also the opportunity for ongoing support from your classmates. In everywhere there are Scrum courses of varying quality on offer, so the most efficient way to select one is probably by asking people. Word of mouth is very powerful, and you will get real information about the trainer. The training programme must contain practice hours. This is when you verify your theoretical knowledge, and where you really absorb the material. Listening to lectures is boring, and you actually don’t learn that much; but practising it during the course helps you get a real understanding. On top of that, when you figure out how things work, you are more likely to remember it automatically. Please check how many participants are to attend at a given date. The higher the number is, the lower chance of individual contact with the trainer and of having all your questions answered. On the other hand, being alone is not good either, as you need a team you can train on. In my opinion, eight to 12 people in the room is the right number, as the trainer can replicate two Scrum teams. 6 works but at 16 its getting hard to get the trainers attention. 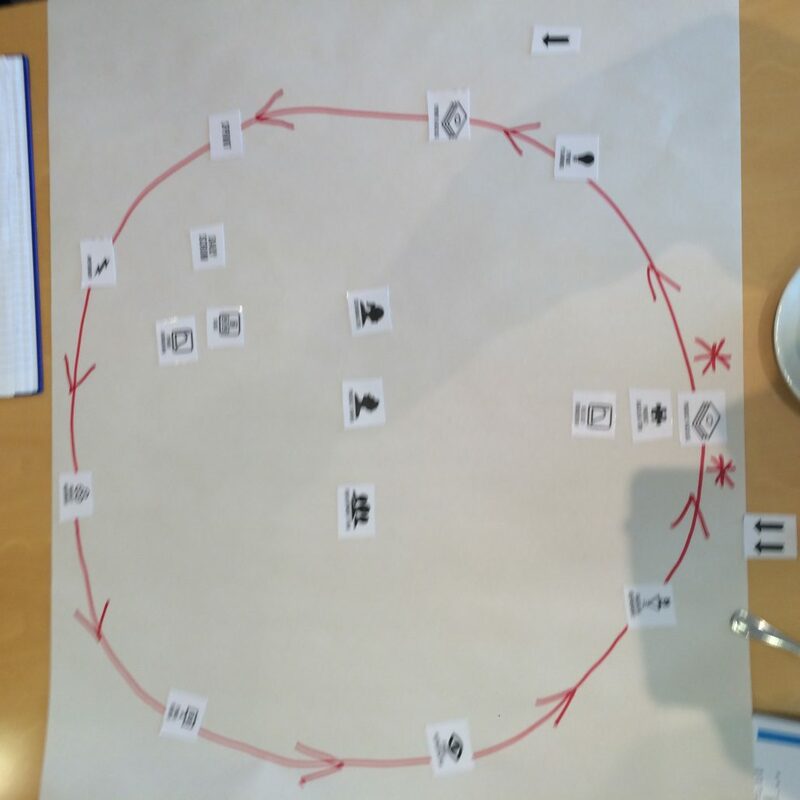 Real Practice – learners design their own Scrum process. On the scrum.org page, you will find the “Open Assessments” tab where you can check your knowledge about the Scrum framework. This sample exam is a must-do thing before the exam, for three reasons. The first reason is that it will allow you to check whether you are good enough to pass the final exam. It will save you stress and money, as this is free of charge, so you have nothing to lose. The second reason is to see what the real exam looks like, and how fast you are able to read and answer the questions. It will help you get used to the pressure of time, and will give you a feel for the exam and how it looks. The third reason, equally important as the first two, is that by answering those question, you are still learning. What is great is that you can do open assessment many times, and each time you will answer different questions. By doing this, you simply learn new things, and new ideas appear in your head. You can find answers to them later in books, and so your knowledge will grow. Remember that some of those questions are similar to, or the same as, the ones in the real exam – so don’t just pluck answers from the air. 3. Explore the Scrum Guide. The Scrum Guide is your primary source of knowledge. It is a short read, but every sentence matters. It’s dense with information, so read it a number of times and stop to think about the implications of each sentence. As it is for many experienced Scrum Masters, you will still need to look back at this document throughout your career, so get to know it. The PSM I exam is sometimes tricky, and a small detail can decide whether your answer is correct or not. General knowledge is not enough, as it leads to quick but wrong answers in the exam. You need to know exactly how concepts are presented in the guide. 4. Buddy up for a day. If you are already working in an Agile company where there are Scrum Masters, you are lucky. Ask any of them if you can become his or her ghost for a couple of days. Buddying is a learning technique, where one employee does their daily tasks as usual, while the second person follows what is going on. The buddy accompanies the employee all day long. You learn by observation, but you also get to ask anything about the Scrum Master’s work. The most important thing in this exercise is that you will encounter real-life situations, which will generate tons of questions in your head. You can get instant answers to those questions, as the expert is at your fingertips. I can guarantee that you will learn a lot, and it will be a kind of interesting experience for you both. You should read first before contributing any questions. As you read loads of questions and answers, you will get to see different points of view, and then start to formulate your own. 6. Choose the perfect time and place. The good thing about the PSM exam is that you can take it at a place and time of your choosing. Most people are at their peak effectiveness in the morning, but there are exceptions to this rule, so choose what is best for you. The other important thing is choosing a place. Be sure you won’t be interrupted, and there won’t be any annoying background noise. Having a space where you can read out the question also really helps concentration for some people, and certainly reduces stress. 7. Read the exam carefully. There are 80 questions, and 60 minutes to answer them. It means that you have one minute to read the question and give the answer, so don’t be in a rush. As I mentioned above, some of the questions are tricky, and one word can change the whole meaning of the sentence. Spend most of this minute on reading thoroughly before answering. When you get stuck, give the most probable answer, and continue. The system allows you to go back and change the answer if needed, but really a straight-through read is often the best way. It’s a short exam, and you may not have the time to revisit the questions as you go. You can use this article as a starting point for your own checklist before the exam. Check what works for you and what doesn’t. And, after all, this is hard work – so don’t forget to celebrate the success. You will soon be a member of a small elite group of certified Scrum Masters. I am also due to publish an ebook (just tidying it up at the moment) with further information and pointers, so subscribe to be the first to get an issue.